The atomic talking watches are synchronized, every night, with an atomic radio signal; as a result, they are always accurate with no need to reset. 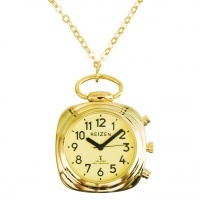 In places where the signal is too weak or not available, one can set the watch manually. Announces time, date, day of week, alarm status, etc. Reizen Talking Atomic Blue Dial Chrome Watch with Blue Leather Band announces time, date, day of week, and alarm status -- plus automatically sets itself. Reizen Talking Atomic Watch-Wht Face-Blk Num-Exp - The Reizen Talking Atomic Watch allows you to enjoy the convenience of hearing the time announced at the press of a button. 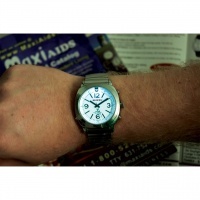 Ideal for those with low vision, imagine never having to set your watch! This talking atomic watch features a clear announcement of time, date, day of week, alarm status and more in a male voice. Can you believe this talking watch even sets itself? The Reizen Talking Atomic Watch also includes adjusting for daylight savings time, so you do not have to worry about it. 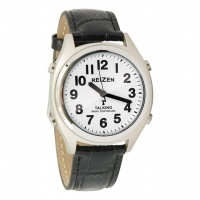 The Reizen Talking Atomic Watch also offers a large face with bold black numbers and hands for easy viewing. 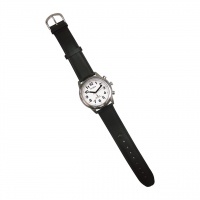 This talking atomic watch is the perfect choice for the blind and those with low vision. This model has a white face with bold black numbers, a gray bezel and gray brushed metal expansion band. 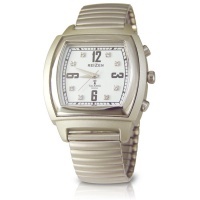 Note to skin allergy sufferers: This watch case is made of type 304L stainless steel. About the Radio Signal (Atomic Function): The radio signal that controls the time, day of the week and date is broadcast through a radio station in Fort Collins, Colorado. The station is operated by the National Institute of Standards and Technology (NIST), which is the U.S. Government agency that provides the nation's official time. Your watch is programmed to listen for the signal coming from this station overnight when it is strongest (at 3am, 4am, 5am and 6am daily) until the signal is received and your watch time is adjusted accordingly. You may also cue the watch to attempt to receive the signal on demand. - Global signals are available in the USA (WWVB), Germany (DCF), the UK (MSF) and Japan (40/60Khz) upon request. There is no Atomic Clock signal available in Australia. - The atomic function and calendar will not operate in Alaska or Hawaii because the watch cannot communicate with the National Institute of Standards and Technology from these states. However, it may still be used in those two states - and in countries where there is no atomic signal - as a regular 'manual-set' watch. Not to be sold in Canada and Europe. The Reizen Talking Watch allows you to enjoy the convenience of hearing the time announced at the press of a button and of never having to set your watch. Ideal for those with low vision, the Reizen Atomic Talking Watch features a clear announcement of time, date, day of week, alarm status and more in a male voice. This talking watch even sets itself, including adjusting for daylight savings time, so you don't have to worry about it. 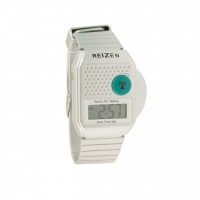 This Reizen Talking Atomic Watch is great in low light situations as it illuminates with the touch of a button. It also offers a large face with bold black numbers and hands for easy viewing. It's the perfect choice for the blind and those with low vision. 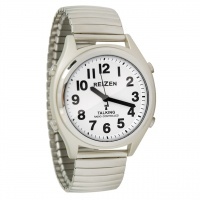 This model has a white face with bold black numbers, a gray bezel and gray brushed metal expansion band. 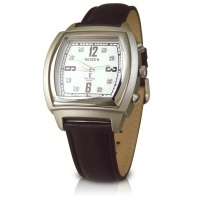 Note to skin allergy sufferers: This watch case and band are made of type 304L stainless steel. 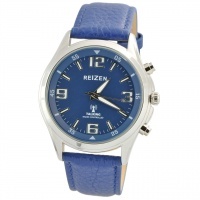 Sleek, attractive chrome-finished watch with great features for the blind and low vision at an affordable price! In the USA, the Reizen Talking Atomic Analog Watch receives a daily signal from the NIST Atomic Clock in Colorado, the nation's timekeeper, ensuring accurate time and even accounting for Daylight Savings changes - so you never have to set it! Time is announced in a male voice in English at the simple touch of a button. A second touch of the button gives you the day of the week and the date. Other features include an hourly chime (which may be turned off) and alarm. The stylish and easy-to-see 1-1/8-in. square white analog face has bold black numbers at 12:00, 3:00, 6:00 and 9:00, and rhinestone chips at all other hours. Chrome expansion band. Battery included. Time is announced in a male voice in English at the simple touch of a button. A second touch of the button gives you the day of the week and the date. Other features include an hourly chime (which may be turned off) and alarm. The stylish and easy-to-see 1-1/8-in. square white analog face has bold black numbers at 12:00, 3:00, 6:00 and 9:00, and rhinestone chips at all other hours. Black leather band. Battery included.